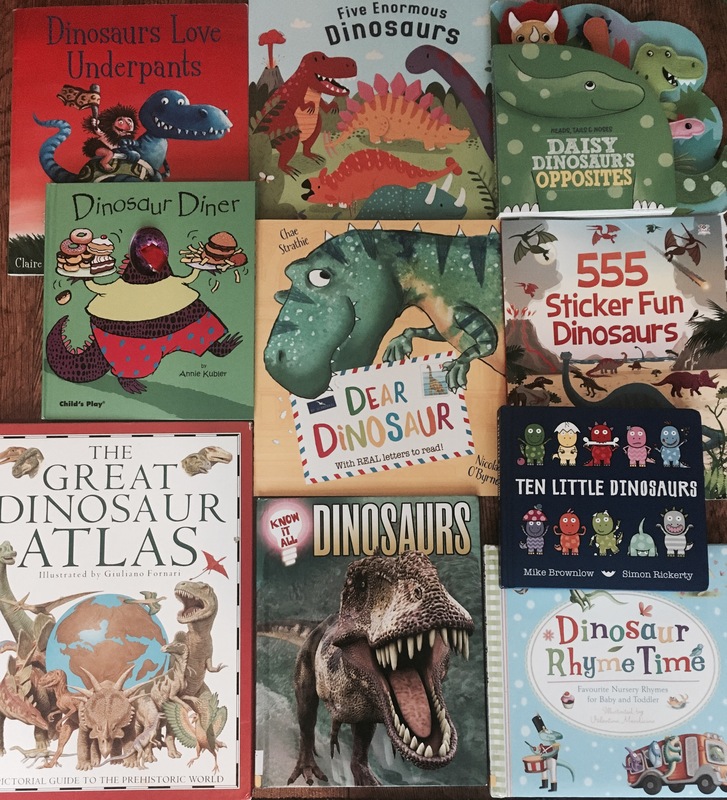 It’s Dinosaur Week on The SEN Resources Blog, so we’ve been searching the bookshelves for our top dino themed picture books. We’ve tracked down some roarsome books! 1. Heads Tails Noses Daisy Dinosaur’s Opposites (Kids Books). We love this book, with its touchy feely dinosaur heads and bright colours. Lovely sensory book. It’s also fantastic for teaching children descriptive language and opposites! 2. 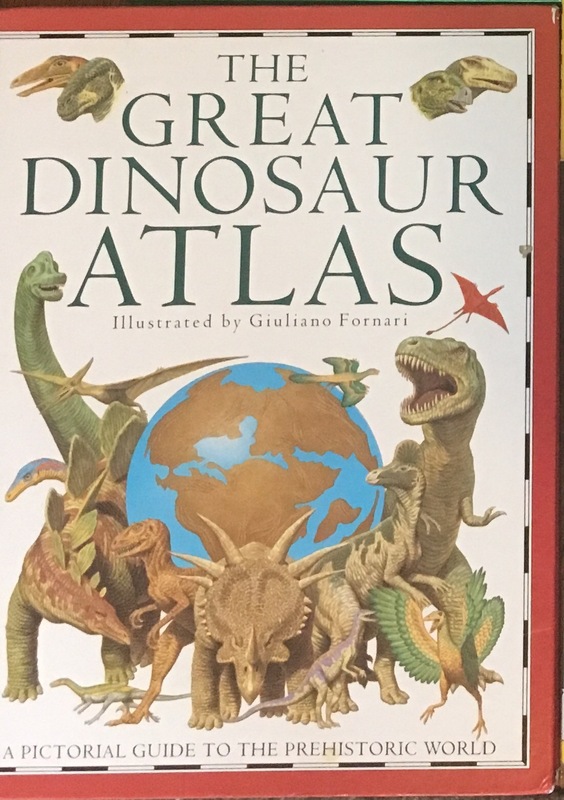 The Great Dinosaur Atlas– A huge, beautifully illustrated, educational book (Dorling Kindersley Publishers). (Franklin Watts) We’ve literally spent hours reading this book, learning the facts, asking questions and looking at the pictures! Great resource for children (and their grown ups!) to build up their dino knowledge. 4. 555 Dinosaurs (555 Sticker Fun) (Imagine That Publishers) The sticker book to get for dinosaur loving kids! An unbelievable amount of stickers with fantastic prehistoric scenes. There’s also brilliant opportunities to learn dinosaur names and habitats! And whilst I mention Imagine That Publishers, Dino fans might be excited to see this book coming soon..
5. Dinosaur Diner (Finger Puppet Books) (Child’s Play) What a fun book! 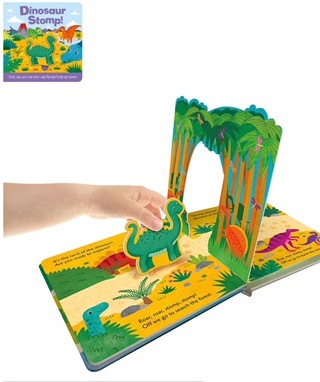 Not only does it have the cutest dinosaur finger puppet, peaking it’s little head through the hole in each page… but it also teaches children about healthy eating and exercise! Wonderfully unique. 6. Ten Little Dinosaurs (Orchard Books) My youngest’s absolute favourite book! Adorable illustrations, hilarious story and a happy ending..what’s not to love? 7. Dinosaurs Love Underpants (Simon & Schuster Children’s UK) This book has my children in fits of giggles with its mentions of underpants and ridiculously funny theory for the extinction of dinosaurs! 8. Dinosaur Rhyme Time (Faber & Faber) Classic nursery rhymes accompanied by cute, dinosaur pictures. Lovely, squishy hard back book for toddlers who love nursery rhymes. 9. Five Enormous Dinosaurs (Classic Books with Holes Soft Cover) (Child’s Play) A gorgeous dino book with colourful illustrations and clever cut outs to help teach children how to count! A fabulous bedtime story about a boy called max who’s pen pal is a T-Rex from a museum! It’s engaging and interactive as children get to ‘open’ the letters themselves. Please note this blog post has affiliate links to Amazon. We are also sent samples of some books to review. All opinions are our own. For more information see the About Me section. Oh I’m so pleased you like it! Dinosaurs are great! The names are brilliant for getting children to attempt to sound out difficult words too!